Pantone has declared Greenery as their Color of the Year 2017 saying "A refreshing and revitalising shade, Greenery is symbolic of new beginnings." In 1963, Lawrence Herbert, Pantone's founder, created an innovative system for identifying, matching and communicating colours to solve the problems associated with producing accurate color matches in the graphic arts community. His insight that the spectrum is seen and interpreted differently by each individual led to the innovation of the PANTONE® MATCHING SYSTEM®, a book of standardised colour in fan format. The PANTONE FASHION, HOME + INTERIORS Color System is a vital tool for designers in the apparel, home furnishings and interior design industries for selecting and specifying color used in the manufacture of textiles and fashion. The System—consisting of 2,310 colors in cotton or paper format— is ideal for assembling creative palettes and conceptual color schemes, as well as for providing color communication and control in the manufacturing process. Here are a few examples of the 'Green trend' for 2017 using the many shades of green out there. 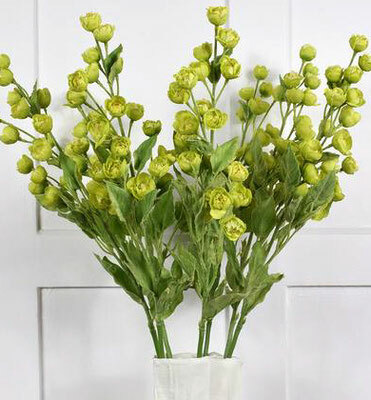 Add some vibrant spring colour to your table, in green of course! 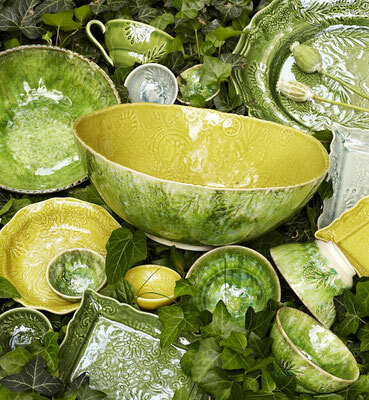 Sthål ceramics know what it takes to make food look good. Always searching for tableware to use that stands out from the ordinary they set about creating their own range and the result is Arabesque - bohemian everyday ceramics. The spring colour palette for 2017 includes contrasting verdant shades of Olive, Antique, Primavera and Seaweed ideally suited to enhance the colours of fresh fruit and vegetables of the season. On trend for 2017 are jungle print wallpapers and of course being green it ticks both boxes. 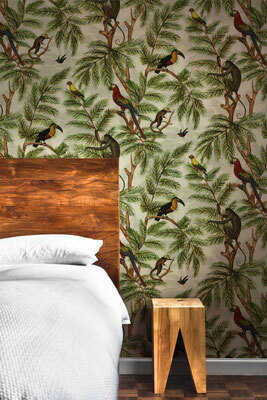 The Jungle print wallpaper design by Miki Rose features subtle palm leaves, parrots, monkeys and a wonderful toucan - the look is firmly bohemian with clear influences from the natural world. Miki's designs use a variety of techniques and combinations including hand painting and layering to create a charismatic wallpaper. 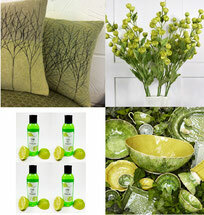 Bringing some green in from the garden during winter to brighten up the home can be challenging. Once considered crass, faux flowers are now taking centre stage in interior design schemes. With careful attention to authenticity and detail in design, faux blooms look as stunning as the real thing - whether you used them en masse or highlight a single specimen they remain at the peak of perfection all year round! 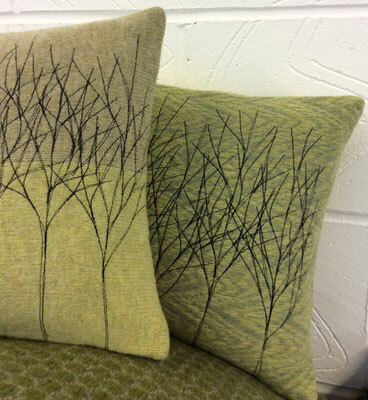 Cushions in luxurious merino wool knit with free stitched tree design use subtle shades of green to give a real feeling of being at one with nature. 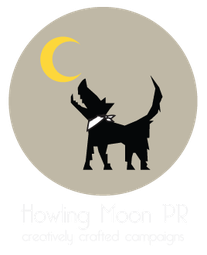 The use of natural fibres is also very much on trend, using only 100% British wool from heritage sheep breeds Janie Knitted Textiles produces a range fashion, lighting and homeware products. 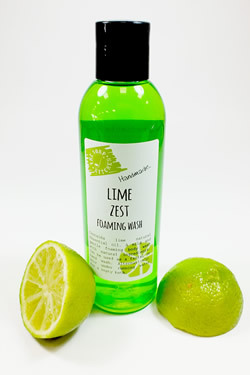 Add a touch of green to the bathroom with a Zesty Lime foam wash handmade by The Soap Kitchen. Zesty lime essential oil gives this wash a fresh and vibrant fragrance, together with a subtle but appropriate lime-green colour. 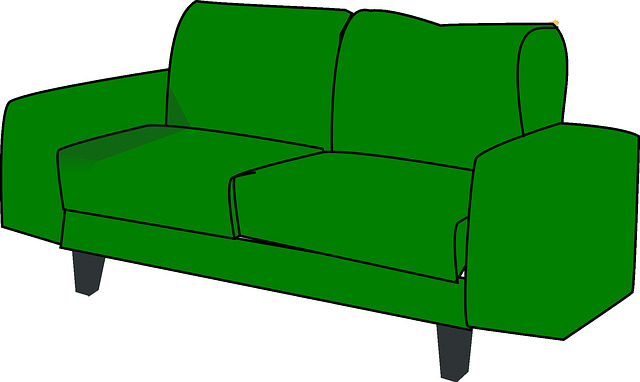 We too are LOVING green at the minute. It is super versatile... do you go for super light and fresh or deep green with tropical influences and accessories.. hard decision!